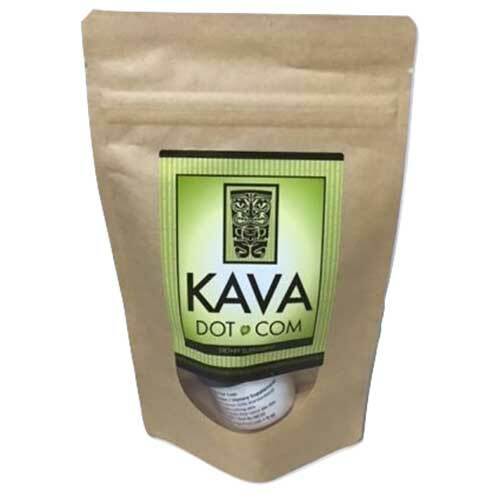 KDC kavalactone 33% powder is a potent kava extract which can be consumed orally or mixed with your favorite drink, while still providing all the stress-fighting benefits that you expect from kava. Naturally promotes relaxation and helps ease the body and mind from daily stress. 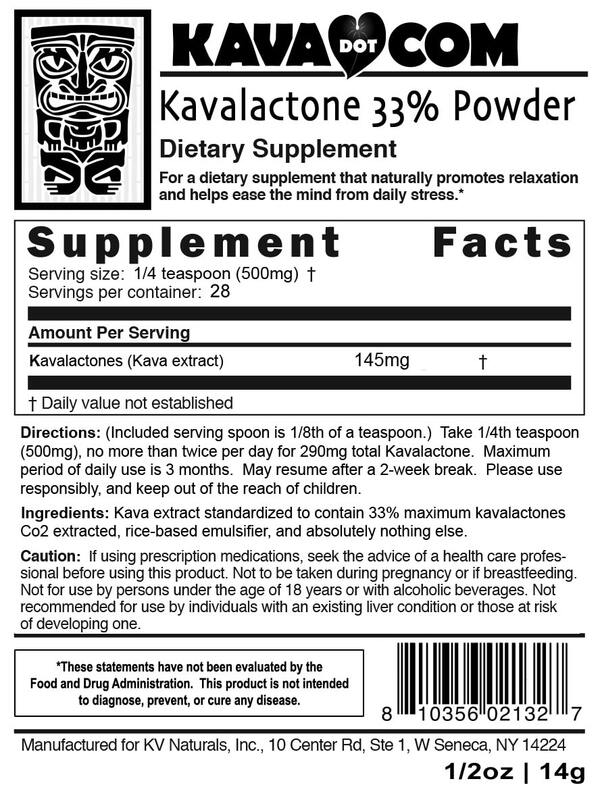 * This all-new container of Kavalactone Powder is a new favorite here at Kava.com! For an ultra-pure extract, this silky powder is made with super-critical CO2 cold extraction technology using only the roots of kava. Please note that is a 33% concentration of a 2-4-6 Kavalactone lineup. The high concentration means you only need to take 1/4 teaspoon per serving. Kava is an all-natural remedy for anxiety, prescribed throughout Europe as a medicine. Here, however, we cannot make any claims for Kava, except the fact that it provides uniquely powerful anxiety support, not found in other products we’ve tried. This silky-smooth Kavalactone 33% Powdered Extract (1/2oz) dissolves best in anything that has natural fats in it, such as milk, soy milk, almond milk, coconut milk, or any other milk product. It also dissolves great in smoothies, especially when they’re made with yogurt. This ultra-smooth Kavalactone 33% Powder (1/2oz) comes in a small 1oz white tub, with a 1/8th teaspoon serving spoon for an accurate dose of Kavalactone every time. We take great pride in care in this product as it’s the exact same product that’s offered in our Kavalactone 30% Capsules. Except it’s one lovely container full, ready for use in anything you can think of. Our favorite way to take it? – Simply scoop it in your mouth, put it under your tongue, and feel the numbing sensation start almost immediately. I had never heard of Kava until I starting having issues with depression, pain, and Anxiety after some health issues. I really didn’t think it would help, had a bad record trying anything natural compared to prescription. However I do not want to take meds for these since these ones are the worst to try because of side effects and dependacy. I ordered the power to try. Still trying to figure out the dosage right. First time I tried it i decided to just put half of the 1/8 tablespoon and put in on my tongue. It does taste pretty bad lol. However it does work very well. It kicks in for me in around 5 to 10 minutes and lasts about 3 hours or so for me. Pretty good since I take half of spoon. I have been feeling better when taking it. Made me more mellow, not worry so much, and helped with my leg and arm. I would recommend it compared to prescription drugs probably cheaper too. I was wondering what the max is a day though. I am guessing 2 scoops of the 1/4 between hours. I will be back soon for more. We are happy that you are feeling better and that Kava is helping you. You can take 1/4 teaspoon twice daily. Each 1/4 teaspoon provides 145 mg of Kavalactone. Daily dosage would be not to exceed 290 mg. I love this stuff. I make kava in a bowl with water and a flour sack. Once it’s a good strong color I mix up 3 tiny spoons full of the extract powder in a water bottle with warm water and shake thoroughly. I pour it into the kava. It’s amazing! I have severe anxiety and depression and this is the ONLY thing that helps me. I don’t take ANY medications. Way to go kava.com. High quality even for someone who was an active kava bar goer. Incredible. Will be a returning customer for years to come. We are happy that you are enjoying Kava and that you recognized all the benefits of it. Thank you for being our valuable customer. This product was very effective as a remedy for acute stress and anxiety. I found that it was a bit slower to take effect than the tincture, however, it was longer lasting and more economical. I only wished it didn’t taste quite so “challenging”, but this is a small price to pay for something that helps with stress, anxiety, sleeplessness, and general mental unease, all of which it has done for me. After hearing and reading about kava i finally decided to give it a try. I would say for me it is definitely like how they say that it has a “reverse tolerance.” I didn’t feel it that much the first time, though I did feel relaxed. But I take it now and I can feel it quite quickly. The taste it definitely interesting. At first it was kinda bad. It is very aromatic and quite and peculiar flavor. Not really something I enjoy, and I have tried plenty of things that taste bad, so it definitely stands out on its own in that regard. Next time I am going to order the full spectrum paste or maybe the powdered root as it seems like it would be a bit more cost efficient per kavalactone. That is one thing I am trying to figure out, what would be the cheapest way to get more. Though I may not because it does seem more like a process and after work I don’t have too much time before I have to get ready for bed. But I would definitely recommend this product and am glad to have found something natural that works so well. It really is an interesting experience. I haven’t gotten inebriated off of it, but it does increase my desire to socialize even at the amounts i take. That may be why this post is so long, haha. It is a very subtle yet noticeable calm. I enjoy it very much. Thank you kava.com! Im somewhat new to Kava but have tried a few different forms and this seems to work the best for me. And the articles and work that goes into this site is very reassuring and informative, and your product proves it. Thank You. one of my favorites. Works fast and u get in a good mood and happier. the taste is really soft and pleasant. and u dont need much it got i good punch..
At one tablespoon per serving how many are in the 1/2 ounce container shown above? There are approximately 2 tablespoons per container of Kavalactone extract powder. However a tablespoon is well above our recommended dose. We recommend 1/4 TEASPOONS for a single dose. can you mix this with actually kava shell drink? The kavalactone 33% powder can be added to traditional kava drinks or non-kava drinks to add a bit of potency. You probably won’t need to add much more than a tablespoon since this product is quite potent. Enjoy! So glad you like our Kava! The 33% Kavalactone Powder is one of my all-time favorite all-around products here.